It’s not clear who’s behind Moms Demand Automatics, which has nearly 10,000 Facebook followers, but the organization’s swag, including cups and “toddler zip-up hoodies,” is being sold on the Rally for Our Rights online shop. 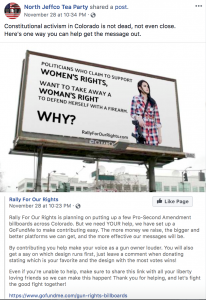 The Facebook page of Mom’s Demand Automatics includes photos of women shooting guns in bikinis as well as a video of a women’s buttocks shifting after she fires an automatic weapon. The fact that Rally for Our Rights is planning to review Colorado’s recall rules at its trainings is significant, because pro-gun advocates waged successful recall campaigns after Democrats passed modest gun-safety laws in 2013. Two Democratic state senators lost their seats in 2015 and a third resigned. Hollywood led the “We Care 4 Weld County” group that attempted to recall Weld County Commissioner Barbara Kirkmeyer back in August. Hollywood’s group failed to gather the 5,767 signatures needed to place a recall initiative on the ballot. Colorado’s 2013 laws require background checks prior to all private and online gun sales in the state and allowed a gun’s bullet holder, called a magazine, to hold no more than 15 bullets. But this year, gun control measures have high approval ratings in Colorado in the wake of repeated mass shootings. Democrats who avoided talking about gun control on the campaign trail in the past proactively promoted the issue in the last election and vilified the National Rifle Association as blocking modest efforts to save lives. In fact, the NRA’s presence in Colorado was seen as counter-productive to Republican candidates backed by the organization. And similar questions could be raised about Republican groups that auctioned or raffled off AR-15 rifles this year. Democrat Jason Crow backed a ban on assault-style weapons in his successful campaign against U.S. Rep. Mike Coffman of Aurora. Gun-safety activist Tom Sullivan, whose son died in the Aurora theater shooting, won a Colorado state house seat here in Colorado. Gun-safety advocates are reportedly prioritizing two bills in the upcoming legislative session. A “red flag” law would allow police to take guns from people deemed by a judge to pose a significant risk to themselves or others. A second bill would deny guns to people convicted of violent misdemeanors. Most Republicans oppose such bills due to fears that they would lead to the confiscation of guns in unintended ways. Or because they oppose all restrictions on guns. Earlier this year, Republicans in Colorado’s state senate blocked a red flag bill that had cleared the house with bipartisan support. Now, I know we need to take away their guns. M249 has most recently been used in the Saudi-led invasion of Yemen. It must be MBS approved.
. . . because what mom, convicted of a violent misdemeanor, doesn’t need enough “self-defense” firepower to take out the whole damn soccer team??!!?? Perhaps Butina will get a furlough and be able to address the group. My guess is Butina will be able to address the group via Skype, from Russia. She'll get time served and perhaps a symbolic additional week or month, then deportation and notification she won't be allowed back into the US for a while. Do you suppose the Moms Want Automatics will come early for the anti-abortion March for Life on January 12? 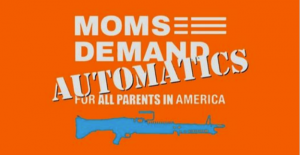 These guys can't be implying that non-parents shouldn't also have fully automatic weapons? Seems contrary to what the Founding Fathers had in mind! Where is Negev at a time like this to answer that question? I'm here R&R! Getting close to sealing a deal on an M249 as we speak…. If that orange sign is their "flag" that's an M60…. Jacking off with the long shiny barrel in his hand reminded him how much it meant to him to be a PROUD gun owner of a weapon that was intended to kill other human beings. Along with the 10,000 rounds and high capacity magazines, he fantasied about all the other deranged dregs of humanity who had access to that same firepower. Jesus would proud of what a holy man you have become. I would have thought Negev wouldn't surface until AFTER the Christmas stocking stuffer sales. Nothing commemorates the birth of the Prince of Peace like an AR-15 under the Christmas tree. Actually I'm not cool with Democrats picking fights with the NRA, bakers or the Oil & Gas industry. Work on healthcare first and then protect our watersheds. Sign the contract with the supertankers and make fire mitigation an urgent priority. Fighting with the idiots is a poor use of this opportunity to address some really urgent needs. I also want health care and environmental protections, but I also am pretty upset about people dying because too many guns are in the hands of irresponsible people. Sometimes, I believe one of our greatest sins as is that we allow this to keep going on and on and on. Correction: The recalls of 2 senators was in 2013. Another senator resigned in 2013. Both the recalled seats were reclaimed in the 2014 election. I still maintain that the recalls were not really about guns. Minor, moderate changes to gun law (<30 round magazine, background checks) doesn't explain the huge amounts of money that were poured into the recall fight on both sides. It was a proxy fight for control of the Colorado Senate. Gunheads were patsies, used for their 2nd amendment fervor, which made them deep-pocketed funders, and trusty voters. On the Democratic side, we had just gone through the Aurora theater shooting, in which an obviously mentally unstable and unfit gun owner should have been prevented from his crime. (Cue Negev to explain with charts that Holmes' 2nd amendment rights are still a higher priority than those 12 moviegoer's lives). So those Democratic emotions were intense, too, wanting to prevent more mass shootings. And yes, we wanted to keep control of the Senate, as well. Add to this that Senator Giron had successfully sponsored the nation's most progressive voting law – providing for all- mail in ballot elections, same day and online registration, etc – which helped turn Colorado blue, and you understand why she had a target on her back. And I'll go further out on a limb and venture to say that there really are not many moms demanding automatic rifles; that this is a proxy fight for the last gasp of Trumpism in Colorado. Additionally, it is a means to deflect attention from the upcoming Women's March, and the general resurgence of this iteration of grassroots feminism. Perhaps, MJ, perhaps. But while you were up in your rural sanctuary in NE Colorado, I was down at the Capitol for a hearing. I got to listen to all the rednecks driving around, waving their flags & signs, and honking their horns. I wasn't impressed that they were patsies for anybody. Your implication that only Democrats had intense feelings following the Aurora theater shooting is inappropriate. I'll still maintain that the Dems overplayed their hand in 2013 and didn't think things through real well regarding possible reactions from the pro-gun crowd. "Sanctuary", huh? I had to laugh. You do know that some NE plains counties wanted to secede and form their own state, over their gun gripes, cannabis, gay marriage, and immigration. But at any rate, during the recall, I was in Pueblo. I worked hard against the recall, canvassing and calling. Here's my little Honda against the backdrop of the competing anti-recall and pro-recall offices. The huge sign is over the pro-recall office, of course. They claimed that they weren't trying to intimidate anyone. Yes, the gunheads were and still are deluded patsies, but I will concede that the relationship with the Republican party is mutually beneficial – the GOP brings the political power and the deep pockets; the gunheads bring the righteous fervor and fake victim status. I'm not saying that the gunheads don't sincerely believe that Obama or scary Libruls are going to come and take away their guns – but that is a delusion carefully fostered by people – and industries – who know better. That IS a scarewy sign. You should be coming for the guns. Oh, we are. Just ask Dudley and the Lesser of two Nevilles. Keep the coffee hot for us. Shocking revelation. Perhaps you can pull Giron from her new/old gig at the boys & girls club as a martyr spokesperson. She needs the cash. Angela Giron has lived her life with joy, integrity, and purpose. As far as I know, neither she nor Senator John Morse has any regrets about the stances they took. How many of us could say the same? I wonder if she regrets losing it all for laws that have done nothing but double the murder by gun rate. I wonder if she is going to have the integrity to pay back the near $200k she owes the state. I wonder if the joy she took in receiving $300k in Bloomberg cash all while complaining her opposition took outside funds to defeat her keeps her happy while she lies about what she did with the remaining funds upon her defeat. Instead of worrying about what Giron might have done with leftover cash, maybe you should also be concerned about what the Dudster and the RMGO did with their left-over cash. Yes, MJ, I recall the short lived secession attempt by "Northern Colorado." You might recall that I had estimated a bill, to be due upon statehood, of at least $1 billion that the new state would have to pay the rest of us for their infrastructure bought & paid for by other taxpayers.